These products help my hair garden grow! Greetings! Making my own products is something I take pride in and enjoy doing. These products have definitely come a long way. They have reached places I never imagined and helped people in many ways. It feels great knowing that I am putting goodness into my family’s hair and body and to that of my amazing customers! I like to keep the ingredients simple so you can get the full benefits of the ingredients being used. I researched and carefully selected my ingredients based on their benefits for both the hair and the scalp. Due to this, the many of the products are good for multiple uses! Over the years I have been servicing clients and could never quite find that right product for the specific needs of their natural hair so I began mixing for them as well. I experimented with different formulas after considering my customers needs until I found one that helped remedy some of the hair and scalp issues they were having. I also specifically wanted a product free of unfavorable preservatives and harmful chemicals. I have had many clients that were cancer survivors. Some had gone through or were going through chemo and radiation treatments. I understood how preservatives worked on the body and how vulnerable their immune systems could be. Being that your skin absorbs things that you put on it, I wanted to make sure that any product I used on them was as gentle on them as possible while still being effective. If you follow me on social media, you would have seen that I gave some of my products a makeover. The product that made the biggest change was the Hair Garden Cleanser! It went from a liquid base to a whipped base that still includes all of the same ingredients from the previous recipe minus the water (but with a few new ingredients added). It is still great for gently cleaning the scalp and the hair. It helps make detangling a breeze! Essential oils aid in management of scalp ailments while natural proteins aid in strengthening and protecting the hair. The original and most popular formula is the healing and sealing one with is based with peppermint and eucalyptus. Also available in the moisturizing Mango Punch formula with real mango and tangerine butter! Soothing Mint Cleanser and Mango Punch Cleanser – $12.00 for 8oz – Lathering, moisturizing shampoo, all natural ingredients, gentle cleanser. Detangles and softens. Soothing Mint soothes and heals while Mango Punch softens and protects. Conditioner not needed for some hair types. Sulfate-free, vegetarian. 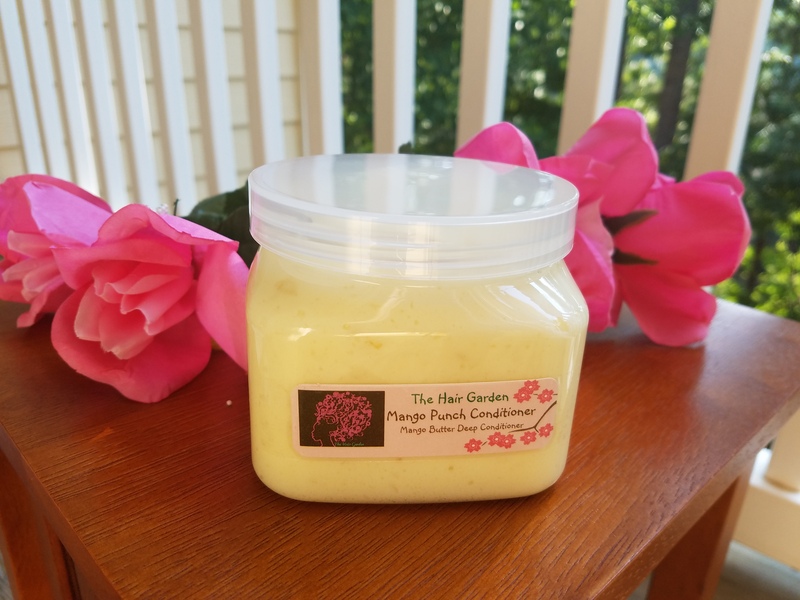 The other new addition to the Hair Garden product family is the Mango Punch Conditioner. It has gotten popular very quickly! This conditioner is very versatile as well depending on you hair needs. It contains mango butter and olive oil and olive oil for their great conditioning properties and amino acids to add elasticity the hair. Use this product under the steamer or with low heat under the dryer. Many of my customers love it as a leave-in conditioner! A great choice for twist outs! 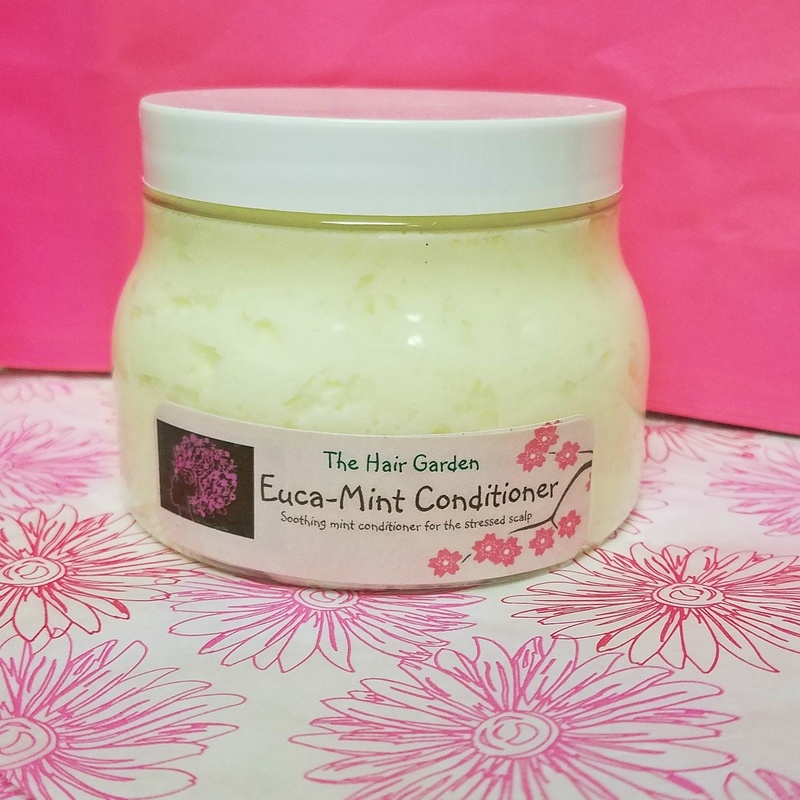 Mango Punch Conditioner and Euca-Mint Conditioner $10 for 8 oz jar. Plant-derived conditioning base with rich butters and oils included as well as strengthening proteins. Mango Punch is great for strengthening and protecting. Euca-Mint is good for soothing the scalp and balancing pH. 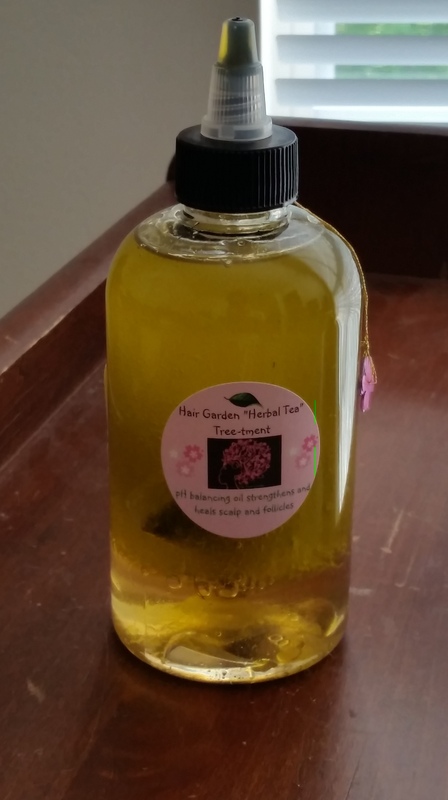 *This herbal tea infused oil for the hair and scalp is the 1st and only one of its kind and originated by The Hair Garden Nursery! The “Herbal Tea” Tree-tment is one of my most popular items and has been a long-time favorite for many of my clients. Especially those that were dealing with scalp ailments such as fungal infections and even traction alopecia. It contains a tea bag filled with lavender petals, peppermint and eucalyptus leaves, horsetail and rosemary amongst other beneficial ingredients! These ingredients infuse into your oil giving your scalp and follicles the boost they need! I have also added a few new herbs to the blend that are great for the scalp and follicles! For example, strengtheners such as silica and healers and moisturizers like aloe vera. This oil blend is great to include in your scalp massage routine or even as a light pre-shampoo treatment!! This is a highly praised as a leave-in and rinse out conditioner for my braid and loc wearers! Many like this light leave-in for their little ones! I really wanted a conditioner and moisturizer with all natural ingredients so I came up with this. I have a softener that I just developed with the intention of being a rinse out conditioner, however, during my personal trials it ended up working for me as an awesome leave-in! This product has the versatility to be either depending on your hair type and needs! Has a light, powdery vanilla scent. Avocado Shea Moisturizer – $8 for 8oz – Light daily leave-in conditioner great on damp or dry hair. Aids in smoothing and taming frizzy, fine hair. Made with avocado and shea butter and aloe. Silk proteins and essential oils heal and strengthen. Hair Garden is introducing the new Hair Juice Mist! Think of all of the benefits our body gains when we consume fruit juices. I just took the ingredients that would benefit from the outside-in and combined them in this amazing little spray! It is a light mist that was originally created to be a loc spray but it can be used to moisturize all hair types! I has an aloe vera base and has a special blend of fruit and citrus oils and emollients. Great for a daily moisturizer for locs, braids and natural hair. Can be used on the hair, scalp and body! My whipped shea butter made with all natural ingredients. Great for the hair and the body. Has great protective and moisturizing benefits! Contains quality ingredients including 100% natural shea butter, olive oil, aloe vera, and silk protein. Great for everything from chapped skin to braiding! Excellent for dry skin and hair ends! 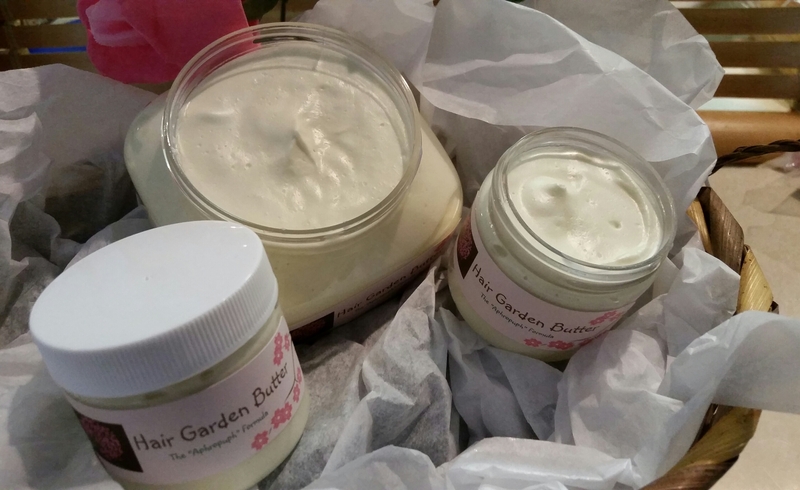 Hair Garden Butter (shea) – $8 for 8oz – Softening, strengthening and protective shea butter formula. Made with natural humectants and proteins. Great for the hair and body. Other scents available! E-mail me at hairgarden@live.com or send me a message using the form below for additional details or to find out how to get yours now! I would love to hear how you use these products! Hello, Excited anout your progress. I have a short natural and I am looking for a product to eliminate the dullness and give my hair a glow look without the overly oily look. Do you have a product for my hair that can provide the texture described above?